North Korean forced migration has become a hot topic in the Western media. Largely driven by the publication of memoirs by several high-profile North Korean ‘defectors’, the plight of the North Korean citizenry and the harrowing migration stories of escapees has captured the public imagination and provoked debate within Western liberal democracies in regards to North Koreans who seek asylum beyond South Korea. With Mrs B., A North Korean Woman, director Jero Yun adds to the growing number of documentaries shining a light on the experience on North Korean outward migration. Mrs B. is a beautifully shot production, in which Yun has gone to extraordinary lengths to show the hardships experienced and risks taken by North Koreans as th ey travel from the Sino-Korean border to Thailand, through jungle and river ways, all the while evading detection from Chinese authorities. In the opening five minutes of the documentary, ‘Mrs. 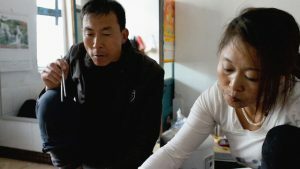 B.’, a middle-aged, North Korea woman and the lead character of Yun’s documentary, confesses to having smuggled drugs from North Korea, acted as a pimp for North Korean women, and made a living from smuggling North Koreans through China. Unlike Seoul Train (2004) or The Defector: Escape from North Korea (2014), productions that position the helpless, hapless North Korean in opposition to the evil of the North Korean regime, Mrs B. unsettles the good/evil binary. Mrs B., herself the victim of people smugglers, presents as both victim and perpetrator: a victim of the structural violence of the North Korean government and the grinding poverty that forced her to go to China, but an unrelenting agent in her determination to provide for her family no matter what the consequences to others. We learn early on that Mrs. B. left her North Korean family in search of work. People smugglers subsequently sold her to a poor Chinese farmer. Recognising the money to be made in the people moving industry Mrs B. started smuggling North Koreans. “I get 1,000yuan for each person who makes it to Seoul,” she explains. Her North Korean husband and sons, whom she also smuggled to South Korea, now live in Seoul. Mrs. B. tells us her plans to migrate to South Korea to join them, using the established ‘underground railroad’ through which some 30,000 North Koreans have already made it to South Korea. Following her arrival in South Korea we learn that life in Seoul for Mrs B. is not as she expected. Denied ‘protected persons’ status by the government, who suspects her of being a drug dealer and possible spy, she lives in a small apartment with her ex-husband and two sons on the outskirts of the city. “This country makes me sick,” laments Mrs B., reflecting on life in South Korea. The dissatisfaction she expresses and her homesickness for life in China is representative of how many North Korean new arrivals feel towards their life south of the 38th parallel. In this respect, Mrs B., A North Korean Woman, bears a close resemblance to Park Jung-bum’s Journals of Musan (2011), an equally confronting film that underlines the difficulty North Korean migrants face once they reach South Korea. Mrs B. is a much needed contribution to the growing genre of North Korean migration films. In blurring the lines between victim and perpetrator, in illustrating how the lives of desperate North Koreans are marked by poverty and criminality, and by showing the human face of the poor Chinese family who buys Mrs B., Yun brings colour, texture, and much needed nuance to a largely opaque and polarising issue. For anyone with an interest in forced migration Mrs B. is a fine ethnographic account of the gendered experiences of poverty and displacement, and the constant tensions extant between human agency and structural violence. Mrs. B. A North Korean Woman is available on DVD from Icarus Films.